We are a family run self storage and removal business situated 1 mile from Newtownards at the top of the Ards Peninsula, within easy access of Bangor, Comber, East Belfast and the whole of North Down, County Down and Northern Ireland. Self storage for home, furniture and business contents in indoor storage units. A full removal service either into our storage facility or simply from one address to another. A full range of packaging materials are also available for sale. Whether you are moving house or relocating your business, or simply want a few items stored or moved, we can help with all your removal needs. So whatever your storage and removal needs…..we’ve got it covered! "My husband and I recently moved house in February and our experience with Mark and the rest of the team at Ards Self Storage & Removals was excellent. 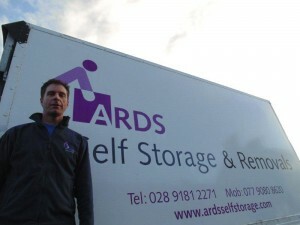 We had to avail of their removal and storage services, both of which were absolutely brilliant. They looked after our belongings, were careful moving them and also very efficient. They also ensured that our more delicate items were well packed and protected. Many thanks for making the whole process a little less stressful! Kirsty & Colin Menagh"